This robust easy to use handheld device takes and records temperature readings via the attached thermocouple probe. A large touch screen, color display indicates temperature, maximum and minimum readings and will produce a graph of the data. 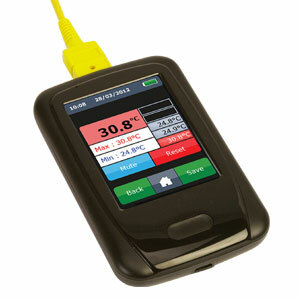 The OM-EL-ENVIROPAD-TC has two functions-Data Logging and Spot Measurement; 1. When in Data Logging mode, the unit can be set-up and left to take temperature readings at pre-determined intervals for a desired length of time. All readings are saved to a file with a date and time stamp in CSV format for up to 65,536 readings. 2. When in Spot Measurement mode the unit can be used as a thermometer to capture one-off temperature readings displayed on screen. This can be repeated for up to 65,536 readings per file. This data can then be downloaded to PC via a USB connection and opened with Microsoft Excel® or our EasyLog software which is available for free from omega.com. The unit is compatible with any J, K, N and T Type thermocouple probes. The protective boot can be removed for cleaning. 참고: Comes complete with 0.5 m (1.5') USB cable, 1 m (39") Type K insulated beaded wire thermocouple, rechargeable battery and operator’s manual. Type K Thermocouple (shipped in a black box) is 39" total length, has a black grip, and green wire.